Newly added. Our platinum reference room is built with the same ideal acoustics as our reference room and features the latest McIntosh Reference System - it is their most powerful two-channel home audio system. For a limited time: It features the only Focal Utopia EM Evo Grandes in the US and they are driven by the Naim Statement Amp. We start with a room with ideal acoustics — bass absorbing wall panels and minimal reflective surfaces—a perfect setting for transparent listening. McIntosh Amp power pushes drivers from high-end marks such as McIntosh, Sonus Faber, Klipsch and Focal. We’ll demo high-quality tracks from a number of sources: turntables, CD, uncompressed digital audio. We have vacuum and solid-state amps to suite your particular taste. Don’t have a dedicated listening room in your home? Then you probably have a private room where you can enjoy a drink or wind down while absorbing your favorite albums. Our den area is one of those rooms. This area has 2 channel systems as well as a variety of headphones across all price points. 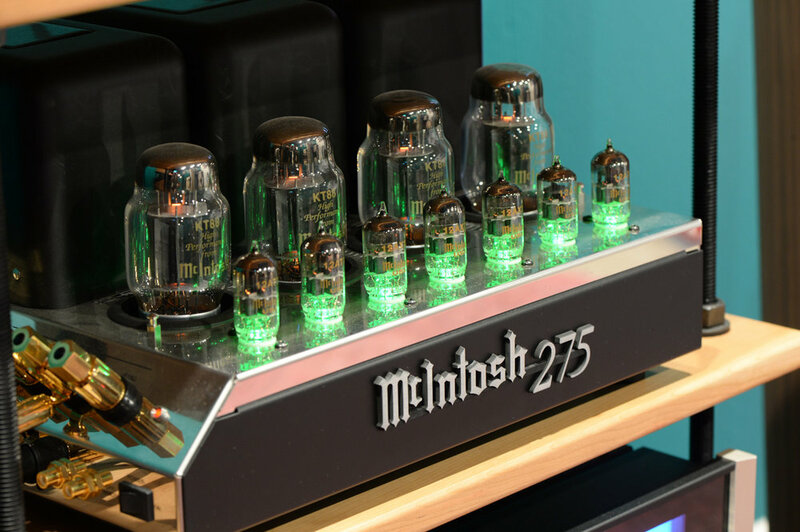 The legendary McIntosh 275 amp and PrimaLuna Amps provide plenty of power for several speaker options. A fantastic neon setting full of ridiculous film and music memorabilia, the large space boasts several open air listening areas and surround sound systems with a wide offering of our product lines. Some people spend a lot on the video part of a home-theatre system, but skimp on the sound. You might as well be watching a silent movie. Full immersion is important! Why would you make shortcuts on audio? Driven by pure, clean, legendary power, our home theater showcases both an awesome two-channel listening experience and a phenomenal multi-channel event. We are the Klipsch Heritage dealer for the South Texas, and this area features an array of Klipsch speakers that you can’t buy at the big box stores. Nestled in a collection of movie and comic memorabilia, this areas features McIntosh Amplification driving three different brands of loudspeakers with Naim streamers providing music. Forget elevator music from a crackling overhead speaker, even our lobby is cool — because it’s one of our headphone listening areas. We start with the McIntosh Headphone Amps to give you clean power. This levels the playing field so you can hear the differences in our headphone line up.